and puppets are the best actors! October 1, 2011: We are having a gallery show of all the Firlefanz Puppets activities at the Albany Center Gallery, November 8 to December 17, 2011 with an opening reception on Tuesday Nov 8. We will be doing The Frog Prince and The Man at the Controls at 7pm and 8pm on the 8th, and scenes from Rhinoceros 7pm, First Friday December 2nd. There will be a lot of Timothy Cahill's photos on display, some Jarry stuff, sketches and info about the puppets. See you there. 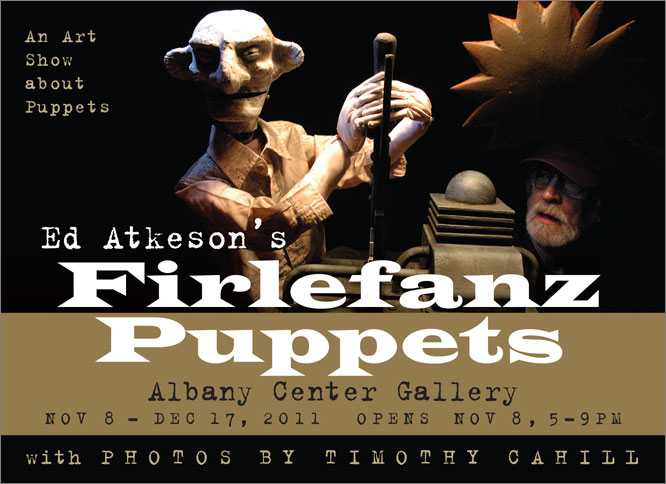 February 15: Firlefanz Puppets is being shown at Center Gallery in Albany. Puppets, props, and a few live shows. This will be some time in 2011, date tba. 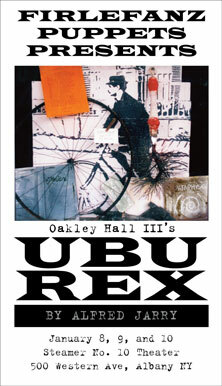 January 23, 2010: Ubu Rex review from Metroland Magazine and an article from Albany Times Union. December 10: another fun rehearsal tonight. Check here for the Ubu rehearsal blog. May 29, 09: We're in LA visiting with Ze and Jody and I went to Alan Cook's International Puppet Museum. It was great meeting Alan and seeing the collection. Later I went to an informal puppeteer gathering where we learned to sing classical Indonesian wayang puppetry songs from artists-in-residence at UCLA. April 27: Relative sizes of Pa Ubu and the Alfred Jarry stage manager puppet. 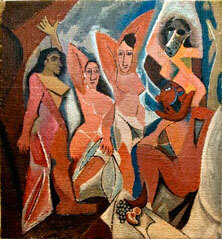 In the puppet play, Picasso is changing careers -- from a painter to a poet. To show his committment he pulls a painting out and shows it to the audience, says a few words about it, and throws the painting on the floor in front of the theater -- then another, etc. It was fun making the copies, and it's a funny bit of business in the play, but I never expected them to be shown in an art gallery. A friend, one of the owners of the gallery, spotted the paintings in my living room and had to have them for the show. 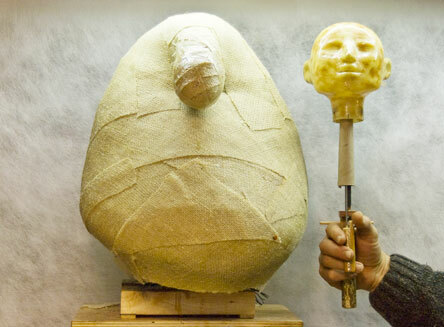 April 20: There is a new section in 'making puppets' about making the oversized head of Pa Ubu. It's not finished, seems to be working well so far. April 10, 08: the new date for the UBU Play is January 8, 9, and 10, 2010. 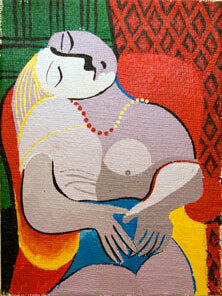 The paintings that go with the "Picasso is a poet" show are on display at the SHOW Gallery in NYC. So one of my puppets is showing in a New York gallery. Pretty good! May 8, 08: I've posted a picture of the "Picasso the Poet" puppets and a new pic of The Man at the Controls. April 6, 08: Script of Vvedenski's "Christmas at the Ivanov's." I'm planning to do it very roughly, stuffed cloth rod puppets. It is hilarious. March 18, 08: There is a new pic of the Frog Prince in the puppet making section. February 28, 08: I've put up some pix of the Frog Prince taken by Tim Cahill. The Frog Prince was put on in January in Troy NY, at the Chapel and Cultural Center at RPI. There were three new plays and an old performance piece. It was great fun. November 27: I have seen the Tiny Ninja Hamlet. November 7: Making progress on Picasso puppet for "Picasso the Poet." Trial and error on the control, but the head came out pretty well. October 30: I've put up a how-to about the chicken foot base I made for a small theatre. October 19: This Sunday Firlefanz Puppets will perform "The Frog Prince" At the Capital Repertory Theatre, 111 North Pearl St in Albany NY. I'm opening for the Discount Avant Garb fashion show. Don't come! The thing is sold out. Photos will follow as soon as I get around to it. July 2: I'm working on the small theatre for The Frog Prince. It is standing on a chicken leg like Babayaga's house. A picture frame theatre with a curtain that opens from the center. June 4: This morning... and Should Pa Ubu wear a tie?... Goethe's Faust? April 26: Reading Gertrude Stein's "Dr. Faustus Lights the Lights" Starts with such promise but fades at the end. Same with Edward Gordon Craig's "Deukalion." The Stein is inspiring though. Should Goethe's Faust story be done from the point of view of Marguerite? It's the book of Job, then Romeo and Juliet, Hamlet. Still love the Walpurgisnacht scene. April 9: A Frog Prince script. March 14: "At the Controls" at the cabaret was a big success. With G. C. Haymes and David Brickman helping out with sound effects and Cathy Frank helping with all sorts of logistics and schlepping -- thank you! -- a good time was had by all. March 8: Work continues on "At the Controls." There is only one puppet, inspired by a character from Erik Sanko's 'The Fortune Teller'. It is a rod puppet with the controls in the back. He has a good head tilt and turn, working mouth and eyes. Also there is the machine, the vibrating wobbling noisy machine with a handle sticking up. And the snow maker, and the soundtrack, and the lights and lightning. Perrformance is in four days. February 7: Dealing with bad puppets. January 24: Puppet for "At the Controls." January 9: I have a piece for Nicole's Experimental Cabaret, second Monday in March. It's called "At the Controls." January 3: Sarah Boxer's 1998 article from the NYTimes about the creepyness of puppets. December 18: Here is a show and tell of the making of the rhinettes's headgear for the Rhinoceros show. December 15: Because someone asked, I've put Gene Mirabelli's script on the Right in the Oval Office page. December 12: The project for the past few weeks has been to make a portable theatre.  It has to be small and light, and have a working curtain and lighting, a way to support sets and the scrim. And it has to be easy to set up. It's coming well. I'm really having a good time with it, making the little ornate touches. November 21: We put on three stagings of Ionesco's Rhinoceros at Steamer No.10 Theatre in Albany NY and it was a rousing success! Almost 200 people watched a two-hour puppet show! It rocked! Puppeteers and readers were separated which gave us the needed pace. We used a thunder box with racquetball balls inside for stampeding pachyderms. It sounded great combined with free jazz saxophone music making the rhino sounds. Here's a link to a photo of the curtain call. Yow! November 16: Dress rehearsal was last night, things are going well for our three-night run of Rhinoceros. Still some lighting tweaks needed, but everything is in place, I have made more rhino masks, I'll post more about them soon. We have eight. It will be nice to have eight rhinocerous people roaming around the theatre. November 7: Here is the "Frog Prince" frog puppet so far. 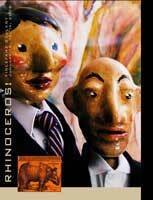 November 6: The Firlefanz Puppets are in rehearsal for "Rhinoceros!" at Steamer 10 Theatre. More info here. November 2: (Faked) Giant marionette in Reykjavik. November 1: A couple of pictures from the Lorca play at Wild in the Woods. October 20: Hard at work on a frog puppet for "The Frog Prince," a hand puppet with moving eyes and mouth. October 10, Script ideas... Don Juan in Hell by G B Shaw. Artaud's Spurt of Blood, Ubu Enchained, and Jean-Claude van Itallie's little plays from the 60s (thanks Melanie!). October 7, Schedule for the Rhinoceros rehearsals is here. Performance is in six weeks! Sept 30, We did the Lorca play at the Wild in the Woods art party at Greg and Sara's. It was magical, a glowing jewelbox theatre set deep in the darkening woods. Thanks to all who helped out! September 11: A sweet little puppet script by García Lorca. "The Little Girl Who Waters the Basil and the Inquisitive Prince." September 7: There's a new page in the "making Puppets" section, some info about hands. Also, I've found Takey's directory of puppet companies. 2200 of them worldwide. I'm browsing Belgium at the moment... pretty inspiring. August 25: I've put up a bit of info on making the puppet heads for the Rhinoceros show. Click the "making puppets" button at the top of the page. I've found the puptcrit mailing list and it's alive and well! August 23: I am trying to decide whether to use a rubber mold-making material for heads. A lot of bother and expense if you ask me, but there are advantages. Polytek TinSil 7025 is the material, if anyone has experience with it I would love to hear. August 16: In September of 2004, a band of talented and up-for-it stalwarts staged a show called "Right in the Oval Office." We did the show in the Firlefanz Gallery to packed houses (for free). Here's a link to the puppets and more info. August 11: Starting work on puppets for a show of "The Frog Prince." We only need to make four puppets, but there's quite a bit of scenery. The heads are about 5 inches tall on average, epoxy and cloth over plasticine, but rough. I'd like to get a lot of tech into the little heads -- turning, nodding, also eyebrows and eyes. August 9: If you haven't seen the little girl giant in London, go here immediately! This project is by Royal de Luxe troupe. Follow the link in the sidebar for more pictures of their projects. August 7: Here are some rehearsal photos taken of the Rhinoceros puppets and players by Timothy Cahill. I'll just start chatting and organize later. Marionettes aren't that interesting to me. I just saw Vit Horejs' "Johannes Dokchtor Faust, A Petrifying Puppet Comedye" and it was great. It was a great raucous playing of Marlowe's Faust, very entertaining. But... still for myself, marionettes are too floating. The attack is too slow. The quick motion of handpuppets or rod puppets is much more satisfying to me. So when it came time to make some puppets, I made heads on rods with some clothing draped over a shoulder crossbar and a hand with a control stick. We did the Princess and the Pea in the backyard. If you follow this link you'll find the script and all. The show was done as a kind of "pickup" show with people pressed into service at the last minute, lots of improv, and lots of line prompting backstage. The theatre was sticks, wire, clamps and cloth. We later did the same play at an art fair, again begging people to join in at the spur of the moment. July 26, 2006: Let's talk about puppets! I'll show you mine if you show me yours. ok, I'll show you mine in any case, but I'm very interested in what people are doing with small scale theatrical projects. This is my most ambitious project to date, produced in January 06 and due to be mounted again in November in Albany NY. Click the picture for more info.